Observation - Hedgehog - UK and Ireland. Description: Small hedgehog eating the cat's food on the front doorstep. I have encouraged it as I am afraid that it may not survive the winter as it is rather small. I haven't seen it since October 19th so I am hoping that it has found somewhere safe to hibernate. 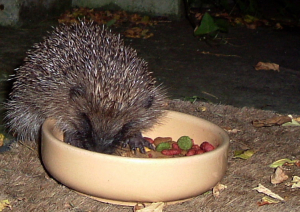 Small hedgehog eating the cat's food on the front doorstep. I have encouraged it as I am afraid that it may not survive the winter as it is rather small. I haven't seen it since October 19th so I am hoping that it has found somewhere safe to hibernate.